Marius Caro is the Count of Leyawiin. His wife is the Countess Alessia Caro, daughter of Countess Arriana Valga of Chorrol. For 7,000 gold, he will sell you a house in town. He is related to two quests: Mazoga the Orc and Knights of the White Stallion. After you complete these quests, he will make you an honorary Knight-Errant yourself, and thereafter you can collect a reward of 100 gold each from him for bringing Black Bows from the local Black Bow Bandit gang nearby. The count wakes up early in the morning at 6am. He is in attendance in Castle Leyawiin County Hall between 8am and 6pm. The only deviation in his attendance is on Sundas where the Count heads to The Great Chapel of Zenithar for worship between 8am and 10am. Between 8pm and 11pm the Count will attend the Royal Banquet. At midnight he will go to bed for six hours of sleep. He wears a black & burgundy outfit with gold trimmed shoes, and a leveled piece of jewelry. He also has a sizable amount of gold, keys to the castle, and a key to the Secret Room. When you first meet him, he will politely introduce himself: "Marius Caro, by grace of the Nine, Count Leyawiin. You are a stranger to me, but well-met." He is pleased with his position as count of Leyawiin: "I am proud of my family's tradition of service to Leyawiin and its people. We face many challenges, but Gods willing, we shall prevail." 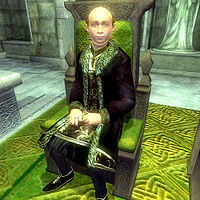 He is, however, not pleased with High Chancellor Ocato's position: "He and the rest of the Elder Council care nothing for Cyrodiil. They focus obsessively on the provinces, leaving us to fend for ourselves." He is selling a house in the east of town: "There happens to be a small home for sale in the middle of town. It's a quaint building, small but tidy." If you tell him you're not ready to buy, he will be angered: "Then stop wasting my time." Telling him the price is too high will disappoint him: "I doubt it will sell anytime soon. If you manage to raise that much, come see me again." If you accept, he will point out its current state: "Very well. I'll have my steward register the deed of ownership. Here is your key. It's a modest home in the center of town. It's a might devoid of furnishings, so you may want to pay a visit to Gundalas at Best Goods and Guarantees. He can fix you up." During Allies for Bruma, you can ask him for help. If the Oblivion Gate outside of the city is still open, he won't help you: "Leyawiin is beset by enemies. The Empire does nothing to help us. Even before this crisis, I did not have enough men to patrol my borders. Now, daedra are pouring out of an Oblivion Gate on our very doorstep! No, I don't have any men to spare. Bruma will have to look to its own defense." When the gate is closed, however, he will help out: "Well, with the Oblivion Gate near Leyawiin closed, I suppose the immediate threat is lessened. I will do as you ask. Let no one say Leyawiin did not do its part to uphold the Empire." Leyawiin guards will point you towards Count Marius when you ask them about Leyawiin, starting the quest Mazoga the Orc: "Orc named Mazoga says she's a knight. I doubt it. The Count wants it looked into. Why don't you talk to him? The Count appears for audiences in the County Hall near the throne weekdays between 8 AM and 4 PM." After this, upon meeting the count for the first time, he will urge you to help him out after introducing himself: "Perhaps you would like to do a service for County Leyawiin?" Asking about it will make him explain: "I need your help. An Orc named Mazoga here claims to be a knight, but will not reveal her business. Find out why she is here, and report to me, and you will earn a reward suitable for those who serve Leyawiin." When you tell him Mazoga wants to talk to Weebam-Na, he will order you to find him: "Then you will get Weebam-Na for her. The Argonian is a well-known hunter; he has a house in town." Should Mazoga die during the quest, Count Marius will be angered by your failure to keep her alive, and will no longer be able to be engaged for a normal conversation, thus forfeiting the subsequent quest: "I hold you responsible for Mazoga's death. Your disappointing performance proves you are not suited for service to County Leyawiin." Strangely enough, he will tell you the exact same thing if Weebam-Na dies before his part of the quest is fulfilled, even if Mazoga is actually alive. After the battle at Fisherman's Rock, he will thank you when you tell him about Mazoga's intentions: "Such vengeance is a noble deed. Leyawiin thanks you for your service. And I have a fitting reward for such noble deeds. I address my offer to you and your friend. Would you like to become knights-errant?" When you ask him about this title, he will explain: "I have created a chivalric Order of the White Stallion. Find and kill the leader of the Black Bow Bandits, the Orc named Black Brugo. If you succeed, I will bestow on both you and Mazoga the titles of Knights-Errant of the White Stallion for your service to Leyawiin. ", after which the quest Knights of the White Stallion will start. When you ask him about the Knights of the White Stallion, he will provide details: "I created the Order of the White Stallion to honor free adventurers who perform noteworthy services for County Leyawiin. I have dedicated our royal hunting retreat, the White Stallion Lodge, to the exclusive use of White Stallion Knights. The lodge lies a short distance north of Leyawiin, on the west bank of the Niben. At sunrise, the view across the water is quite picturesque." When you ask him about Black Brugo, he will provide some details: "The outlaw, Black Brugo, is a menace to County Leyawiin. They call his marauders 'Black Bow Bandits' because they use black bows. Find Black Brugo, and execute him for his crimes, and I will make both you and your friend Mazoga Knights-Errant of the White Stallion." When you ask him how to locate this man, he will point you towards Mazoga: "In her shadowy past, your friend Mazoga might have had contacts with outlaws. Ask her." When Black Brugo is dead, he will be pleased: "Justice has been done. And henceforth, Mazoga and you shall be known as Knights of the White Stallion. May I present you with the perquisites of your rank... a key to White Stallion Lodge and a shield bearing the arms of County Leyawiin. Mazoga's key and shield shall be delivered to her directly. And I promise you a bounty of 100 gold for each Black Bow you bring me." If Mazoga didn't make it, his dialogue will slightly differ from the latter: "Justice has been done. And henceforth, you shall be known as Knight of the White Stallion. May I present [...] of County Leyawiin. And I promise you a bounty of 100 gold for each Black Bow you bring me." At this point, he will be happy to buy Black Bows: "Each Black Bow you bring me means another Black Bow Bandit slain."